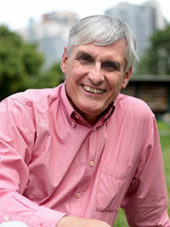 Mike is the Director of the Centre for Biblical Preaching in Melbourne, which trains people across Australia and the world in Biblical preaching. He spent 11 years in Pakistan. He then served as Head of the Department of Mission at Moore College before becoming Principal of Melbourne School of Theology. He’s married to Sarah and they have 4 grown children. He is the author of over 30 books and articles including the 2004 Australian Christian Book of the Year, Stirrings of the Soul. TGCA – What books are currently on your bedside table? I usually keep three or four books on the go at any time. There’s usually a book to feed my Christian mind and right now I’m reading, and really enjoying, Os Guinness’ Fools Talk. Then I want to keep up with contemporary culture so I’ve just finished The Sun, the Moon and the Rolling Stones, and Luc Ferry’s, A Brief History of Thought. And I’m always relaxing with a crime novel and at the moment it’s James Runcie’s, Sidney Chambers and the Dangers of Temptation. TGCA – What was the last book you left unfinished? Frankly, that’s probably most of the Christian books I start. Look, they’re good, but I often think I’ve read it before. I’ve been reading Philip Jenkins excellent The Great and Holy War: How World War I Changed Religion For Ever. A fascinating book, but I’ve been stuck on p.314 for four months! TGCA – What’s a book you feel guilty for not reading? Probably Augustine’s, The City of God. It’s a classic that should be read. I read his Confessions a few years ago and so, given the title, I should probably make a confession: I found it hard going. I should read The City of God but I know I won’t. TGCA – Do you read commentaries straight-through? For quite a while I now I’ve read commentaries for my quiet times. And I read them right through. And I love it. I’m reading Revelation guided by Douglas Johnson’s The Triumph of the Lamb. TGCA – What’s a book that someone needs to write? A theological analysis of Aussie culture. Most of these kinds of analyses come out of America and, as we all know, our cultures are very different. The current US presidential election is proof that there’s a cultural chasm between the US and Australia. I’ve attempted this kind of analysis with talks I’ve given on sport and Anzac Day, but we need a deeper and more far reaching analysis. TGCA – What books did you/do you read to your children? Of course we read the modern classics like The Very Hungry Caterpillar and Hairy Maclary from Donaldson’s Dairy, but for their spiritual edification every night after dinner we read a Children’s bible story or Christian biographies, like Hudson Taylor, George Mueller and David Brainerd. TGCA – What was the last book you gave as a present? Sarah and I read John Woodhouse’s wonderful commentary on 1 Samuel. Sarah immediately ordered four copies and sent them to friends in the US. I’ve just given a number of copies of my short devotional commentary on Matthew, All Authority, to family and friends in the US. They’re related to me and so they can’t refuse. TGCA – What book made a big impact on you during adolescence? I could say Walter Chantry’s, Today’s Gospel: Authentic or Synthetic, but really there were a number of Banner of Truth publications that I read in my late teenage years and early twenties that gave me a great foundation in the Reformed faith. TGCA – Best biography you’ve read? This is really the answer to the last question. 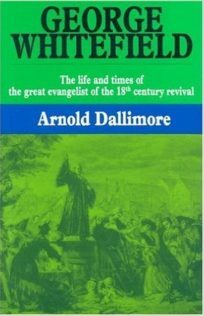 Arnold Dallimore’s biography of George Whitefield remains the biography that impacted me most. The man’s godly character and, under God, his gifts and achievements as a preacher impacted me and, perhaps, fueled my desire to be a preacher. TGCA – What 10 books would you take to a desert island? The first thing I’d do if I were marooned would be to search for ‘The Desert Island Public Library’ (my favourite building anywhere), but assuming they didn’t have one I think I’d divide the 10 between commentaries (maybe on Psalms, Isaiah, John and Romans). Then I’d need Pilgrim’s Progress and a volume of Spurgeon’s sermons from The Metropolitan Pulpit. I need to mention Vishal Mangalwadi’s, The Book That Made Your World because it’s brilliant and should be read. To relax I’d want a large collection of crime stories, and a large book of cryptic crosswords. I suppose my last book would have to be Boat Building for Dummies. TGCA – What was the last book that made you angry? It’s a while ago, but Brian McLaren’s A Generous Orthodoxy would be one of the worst books I have read. He continually reshaped the different Christian traditions in order to blur their significant differences, and then painted a straw-man evangelical that I found unrecognisable. TGCA – Which are the books on preaching that you recommend to people? There are lots of good books on preaching. Our own guys, Murray Capill (The Heart is the Target) and Gary Millar & Phil Campbell (Saving Eutychus) are very good, as is Jonathan Lamb’s, Preaching Matters. But I have to say I don’t read a lot of books on preaching; or, if I do read them, it’s because I feel I should do since I teach preaching. They’re helpful but you don’t learn to preach – or even significantly improve as a preacher – by reading a book about it. You’ve got to do it with, if possible, coaching and feedback from a mentor (and at this point I include a shameless plug for the Centre for Biblical Preaching). TGCA – Is there a book that you wish you’d written? I’d love to write a novel. I admire novelists enormously; their creativity; the way they keep you hooked until the very end. I think I’d like to write a Sidney Chambers kind of mystery. Runcie’s stories combine storytelling and theology. Unfortunately, Runcie’s hero is an Anglican clergyman of the liberal tradition. My hero would be an evangelical clergyman and the book (in my dreams) would be compelling, well-written with a persuasive apologetic. Oh, and it would sell over a million copies! TGCA – Most overrated book? I don’t want to offend an author but why The Prayer of Jabez has sold over 10 million copies bemuses me. TGCA – What’s your favourite time and place to read? Reading is my main pastime, but since I’m always travelling, I do a lot of it in airports and on planes. TGCA – What is a book in the area of New Testament studies that you’d encourage everyone to read? Tom Wright’s The Resurrection of the Son of God is such a robust and compelling case for the historicity of the resurrection. Brian Rosner’s Paul and the Law is also very helpful. TGCA – Which book, apart from the Bible, has most shaped your approach to ministry? Piper’s Desiring God stimulated my mind, warmed my heart and, I think, impacted my life and ministry. I read lots of books, and most are good, but I think very few really shape your life. This ticked all the boxes for me.